Traffic lights using Arduino Uno and 7-segment display. 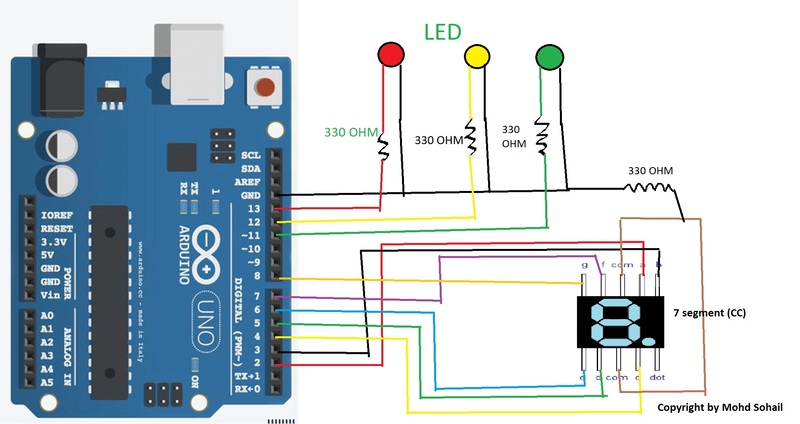 In this project I will show you how to make traffic light signal of one direction using an Arduino Uno and a 7-segment display. This project is very attractive and very much appreciated by teachers of Engineering college. You can also make this project just watch the video and subscribe my youtube channel. Here you can make this project just simply follow the steps. 1. Take breadboard, place RED, YELLOW, GREEN leds with their cathode connected to the -ve rail of the Breadboard. 2. Take 3, 330 ohm or 220 ohm resistors and connect all LED's anode with the resistors. 3. Place 7-segment display on the breadboard and connect a 330 ohm or 220 ohm resistor with common pin of 7-segment display. 4. Do the same connections as given in the circuit diagram. 5. If the 7-segment display is common cathode put a resistor with common terminal of 7-segment display to -ve rail of breadboard. 6. If the 7-segment display is Common anode put a resistor with common terminal of 7-segment display to +ve rail of breadboard. 7. Take Arduino and upload the code. 8. Test for the traffic lights. You have succesfully made traffic lights. Place 7-segment display as shown. Connect resistor with COM pin of 7-segment display. Do all the connections as same as circuit diagram and check all the connections. Upload the Arduino code and check the lights. Your traffic light using Arduino Uno is now ready. And also subscribe my Youtube channel.